Uranus, the seventh planet from the Sun, reaches opposition on October 15th. The distant "Ice Giant" shines at mag. +5.7 in the constellation of Pisces and is marginally bright enough to be spotted with the naked eye under dark skies. However, on opposition day this won't be possible as the almost full Moon is positioned just a few degrees away. Through binoculars and small scopes, Uranus is easy to spot. Uranus is positioned about 15 degrees south and 25 degrees east of the centre of the "Great Square of Pegasus", close to the mid-point of an imaginary line connecting omicron Psc (ο Psc - mag. +4.3) and epsilon Psc (ε PSc - mag. +4.3). Further east / northeast are constellations Aries and Taurus with first magnitude orange star Aldebaran and naked eye open clusters M45 "The Pleiades" and the sprawling Hyades. 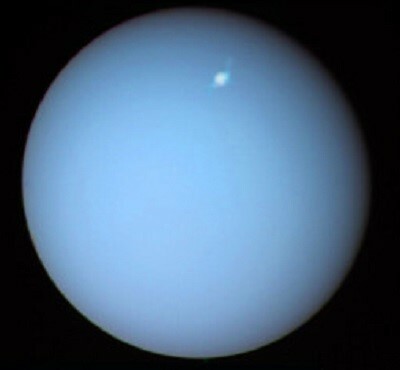 Uranus is visible all night during October. It rises above the eastern horizon around sunset, reaching its highest point in the sky at midnight and then sets in the west as the Sun reappears. The day after opposition the full Moon passes 3 degrees south of the planet and since the Moon is at perigee it appears larger and brighter than usual, a so-called "Super Moon". At opposition, Uranus is approx. 18.951 AU (approx. 2835 million km or 1762 million miles) from Earth. With an apparent diameter of 3.7 arc seconds, small telescopes at medium to high magnification will reveal a small blue-green disk. However, when viewed through even large amateur scopes it's difficult to spot much detail. 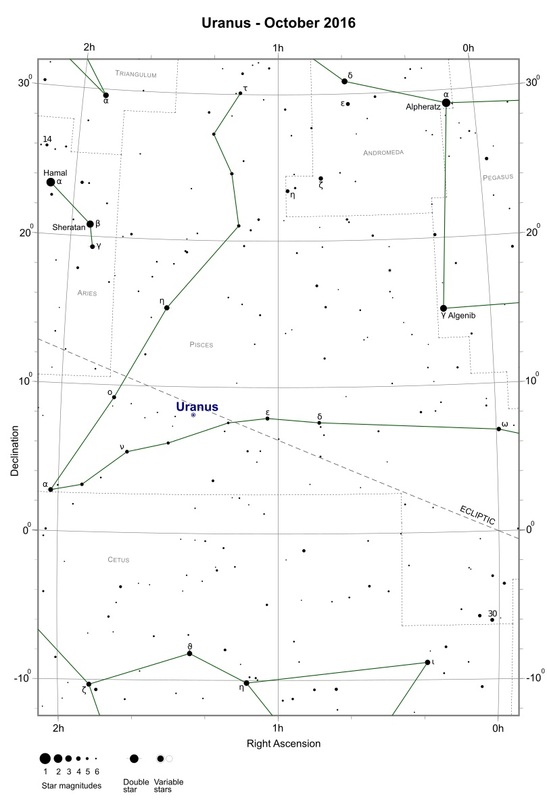 The finder chart below shows the position of Uranus at opposition (R.A.= 01h 23m 24s, Dec.= +08d 05m 05s). Since it moves relatively little with respect to the background stars the chart is also valid before and after opposition.